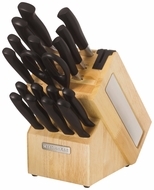 Set Includes: 8-inch Chef, 8-inch Slicer, 7-inch Santoku, 5-inch Santoku, 5-1/2-inch Serrated utility, 4-1/2-inch Fine Edge Utility, 3-1/2-inch Parer, Birds beak Parer, 8 Stamped Steak Knives, Shears, Natural Block with built-in sharpener. Features: High carbon forged stainless steel blade, Contoured comfortable grip handle perfectly balanced and weighted for ease of use. Block includes a built-in Knife sharpener.